It was another professional display from Leek Town as they beat Glossop North End 2-0 to go 4th in the league table. Second half goals from Dan Trickett-Smith and Rob Stevenson ensured the Blues recorded the win and, with Ramsbottom United not in action it allowed Leek to move up the table. Following the midweek win at Prescot Cables, Neil Baker named an unchanged starting 11 for the trip to Derbyshire. While on the bench came Jack Hurd who replaced Jordan Johnson who was missing. The opening half of the match was a scrappy affair with Leek kicking into the wind. It allowed the Hillmen to have the early chances with Kayde Coppin having a shot blocked early on before George Danaher put an effort well over the bar. 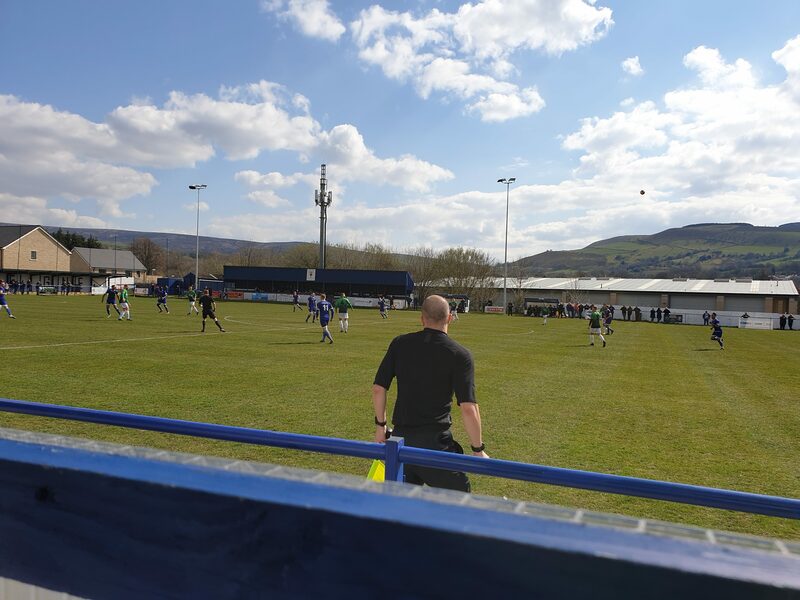 The Blues started to grow into the game with Stevenson firing a shot over the bar before Glossop goalkeeper Matthew Holmes had to make two saves to stop Leek going ahead. Adam Etches should have given Glossop the lead on 19 minutes when a corner was whipped in and, Danny Roberts misjudge the flight of the ball. It fell to Etches who put his volley into the ground, allowing Leek to clear. Leek almost took the lead on 23 minutes when Stevenson made a powerful run down the line before hitting a low shot at goal. Holmes was able to parry the ball and, then grab it at the second attempt with Aaron Bott waiting to pounce. Trickett-Smith almost scored a spectacular goal to end the first half when he attempted an overhead kick. However, it was a comfortable save for the keeper. Leek finally went ahead just eight minutes into the second half when Trickett-Smith did well to collect a long bouncing ball and with two defenders on his case, he managed to slot the ball home to give the Blues the lead. Just four minutes later and it was 2-0 when another long ball through was collected by Stevenson, he was able to round the onrushing Holmes to slot the ball away and, give Leek that breathing space. Darren Chadwick could have added a third with 12 minutes to go when he headed goalwards from a corner. But, the ball was cleared off the line by a Glossop defender. From there the game petered out as Leek Town held on to ensure they got all three points and that is all they can do at this stage of the season, keep winning their games. Their next game is on Easter Saturday as they visit Clitheroe. Leek Town: Roberts, Green, Short (Adebisi, 69), Grocott, Chadwick, Sanders, Maguire, Reeves (Harrison, 90), Bott, Trickett-Smith (Walford, 82) and Stevenson. Unused subs: Hurd and Chapman. Glossop North End: Holmes, Russell, O’Leary, Tuohy, Danaher (Maeico, 71), Arthur, Hickman, Quansah, Frangillo (Czubik, 82), Coppin and Etches (Latham, 82). Previous articleA campaign is set to be launched with the aim of increasing the number of defibrillators which are installed across the county. Vale stop MK Dons getting their automatic promotion spot, for now. Everybody loves radio. It’s on while you’re getting ready for work in the morning or making the dinner in the evening, while you’re in the car, and for some it’s on all day as well. If you’ve got a message that you would like to get across, we’ve got a few tricks up our sleeve to help you do it. Call our Sales Team NOW on 01538 38 20 10 or click here for more details.